Mr Brownson was honoured to become President of BESS (British Elbow and Shoulder Society). As part of the BESS conference held in Coventry this week, The Ricoh Arena, was the host venue for the Conference Dinner on Wednesday 21st June. Mr Brownson was joined at the dinner by his colleagues from Liverpool and all previous shoulder fellows. The Presidents dinner was held at Warwick Castle on Thursday 22 June. At the dinner Mr Brownson was received into the position of President by outgoing President and renowned surgeon, Mike Thomas. 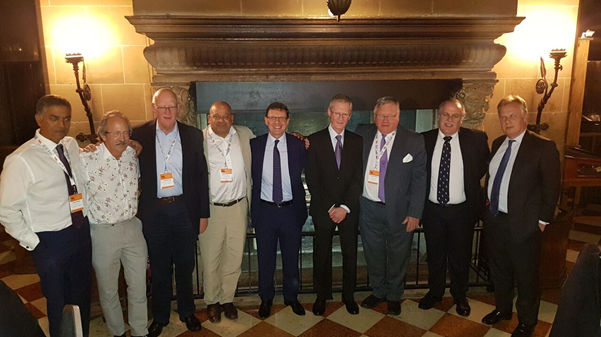 He was joined at the dinner by 7 of the past 14 BESS presidents including Prof Angus Wallace and Mr Mike Watson who are not only past Presidents but also represent two of the original 4 founding members of the Society. Registered Address: 57 Greenbank Road, Liverpool, L18 1HQ. Registered in England & Wales: OC340957.